A Bullet Camera In Every Business, On Every Street Corner? Security and Surveillance technology are an ever booming market. In just about every major business in America today, you can find a security camera system or some type of surveillance technology. The market for it is huge. There will always be thieves and there will always be vandals. That is why there will always be new security cameras and technology being developed to combat the ever evolving ways of crime that people come up with. How many businesses actually use surveillance technology though? That number will never be exact as it is always growing. More and more businesses and people alike are seeing the importance of having security camera technology. Keeping your place of business safe should just come as common sense to just about everyone. The only problem is, is that some business owners might view it as either too invasive or even too expensive. That just isn’t the case. There are too many pros that outweigh the cons in terms of that thought process. Both employees and customers alike want to feel that they are in a safe and appreciative environment. This will keep everyone happy and keep customers coming back (as long as the customer service remains optimal as well). It deters vandals and theft from both outsiders and employees alike. You find security camera systems in McDonald’s, car dealerships, retail stores, hospitals, police stations, and more. There’s clearly a reason for this. It’s all about monitoring and safety for everyone within the facility. Recently there was a game that came out called “Watch Dogs”. Not too go off on too much of a tangent, but the game took place in present day Chicago. In the game the character can hack into the multiple security cameras that line the streets. This part of the game is not fictitious. Chicago is a city that is very heavily monitored and actually does have security cameras on just about every street corner. It’s about detering crime and lowering the crime rate in general. Box cameras, weatherproof cameras, dome cameras, and yes, even bullet cameras are found throughout the city always on the watch. Some may see this as a “bit too much” but if the affects on crime are positive, can it really be seen as a negative? 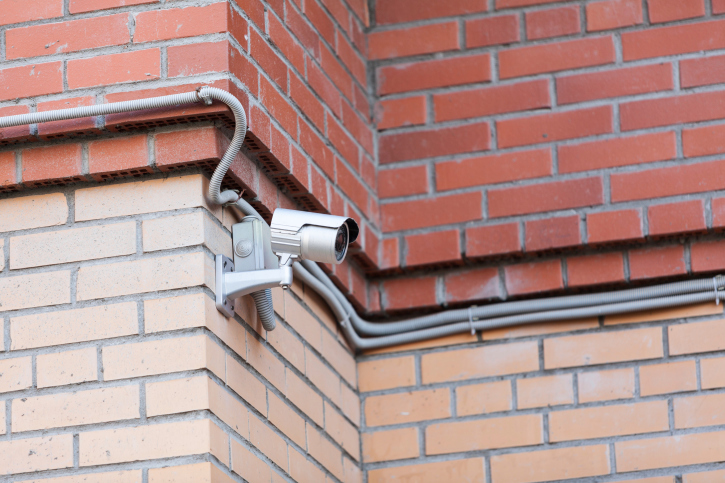 Cities and businesses alike use the cameras to their advantage while also doing their best to maintain certain privacies. Is It Really Too Much? There will always be that looming fear of “is big brother watching?”, but then again, the main purpose of the cameras are to monitor for crimes and keep individuals and products safe. There are still companies today that don’t utilize security cameras or any real type of surveillance equipment other than a bell on the door when you come in. That being said, not every business, home, or street corner is connected to a CCTV grid, and that makes those areas targets for vandalism, theft, and other crimes. The bullet camera, with its naturally small and sleek design, has always been one of the go to cameras in just about every security camera system. They’re easy to maneuver. They’re easy to hide. They almost always come equipped with IR capabilities to monitor in the dark. The idea of having cameras everywhere can be a scary thought, because you never know who is on the receiving end of those feeds. All “big brother” thoughts aside though, one can’t deny the endless applications that come with the use of bullet cameras and other surveillance technology. It’s all about safety, lowing crime, and keeping you your business, home, and assets protected. MicroPower Technologies Incorporated has just entered into an agreement with Sprint that enables the company to leverage Sprint’s network as an additional channel to transmit wireless video. Adding the Sprint network takes MicroPower’s video surveillance solutions a step further by enhancing wireless capabilities with Sprint’s secure and pervasive network, one that reaches more than 282 million people across the nation. The MicroPower Rugged-i is an integrated, solar wireless IP video camera that is deployable in any location due to the fact that it is not constrained by wires or cables for power or data. The flexibility of the Rugged-i enables users to augment existing IP surveillance systems or install a new camera solution in areas that may not be accessible with traditional cameras. In addition to that, MicroPower systems are perfect for remote locations and a comprehensive solution is maximized by the addition of a 3G/4G uplink from Sprint to a secure video transmission to the back haul. 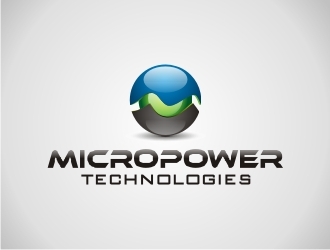 MicroPower surveillance solutions dramatically improve the economics of system deployment through patented technology that also delivers improvements in performance and power without compromising quality and reliability. What’s more is that devices can be deployed on-demand as no wiring or trenching is required, allowing immediate system scalability and a 90% reduction in installation time across the board. Find out what is going on in the Tech Army World. What are the Top 10 Money Making Missions? What other companies have joined and what do they do? 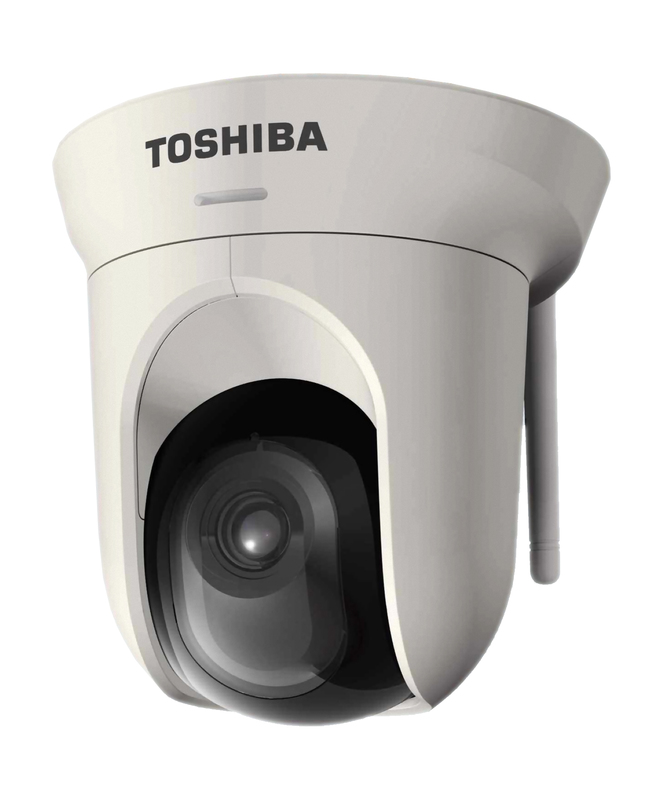 Toshiba has just unveiled a new security camera designed to make wireless security solutions easier for indoor use. The new camera comes to us as the IK-WB16A-W 2MP IP camera, which is also equipped with 802.11n wireless connectivity as well as a whole host of other features that are sure to make any indoor wireless security surveillance system go up with ease. The camera’s megapixel resolution allows a single model of the IK-WB16A-W to wirelessly capture an overview of a large room or space, which makes it especially useful in areas like grocery stores, shopping malls, casinos, parking garages, storage rooms, warehouses, etc… In addition to that, the camera is also capable of capturing high-detail situations, including close-ups on the smallest of objects. The wireless flexibility of the IK-WB16A-W, as well as versatile PTZ functionality, allows installers to have a greater amount of freedom when mounting the camera, including areas that aren’t wired with Ethernet cabling. After the camera is installed, its live video can be viewed and camera movements can be controlled via a network linked PC, notebook, tablet or smartphone. The IK-WB16A-W also supports simultaneous quad-streaming of MPEG-4 and MJPEG video in a plethora of resolutions in order to provide both higher quality and optimal bandwidth formats. A maximum of ten clients can also simultaneously access live video streams as well as record video directly onto a PC hard drive or NVR. In addition to that, the camera also features a Micro SD card slot for local storage, just in case you lose connection. An advanced 1/3.2″ CMOS progressive scan sensor also delivers flicker-free, ultra-sharp color video up to 30 FPS without any picture blur and user-selectable resolutions range from megapixel 1,600 x 1,200 to cellphone size 176 x 144 pixels. In addition to that, there is also a 4x digital zoom for higher resolution settings. The IK-WB16A-W camera package includes free versions of Toshiba camera recording software that enables video recording, exporting and uploading, motion detection and alarm recording, auto PTZ and two-way audio communication. Renting projectors for meetings, events, trade shows, and projectors is easy at Rentourprojectors.com! You can rent projectors for by the day, week, or month! 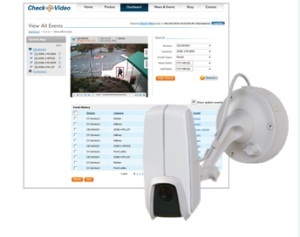 CheckVideo just recently announced the expansion of its product portfolio with the all new CheckVideo IP Camera. The CheckVideo IP Camera incorporates a video camera along with a DVR and high-performance video analytics all in a single device. One interesting feature that comes with the CheckVideo IP Camera is the fact that the device works with the cloud-based CheckVideo Software Service in order to provide you with a complete, expandable video surveillance and recording system, complete with video management functionality. CheckVideo sends users critical, real-time alerts that allow you to act quickly to any situation. It also allows you to verify and prioritize alarms, shorten law enforcement response times, stop crimes in progress and reduce fines for false alarms. The software watches the CheckVideo IP Camera 24/7 for anything of interest and also extends the security perimeter to outdoor areas where PIR motion detection is unavailable or ineffective. Video alerts are also based on the presence of people as well as vehicles, not just motion, and can be sent to a central monitoring service, email address, smartphone or the secure CheckVideo Web portal. Another good thing about the CheckVideo IP Camera is that it is small and unobtrusive in indoor environments as well as outdoor areas. This device doesn’t require additional hardware or software on site, nor does it require specialized IT skills for installation. Configuration and management are completed remotely via the internet as well, keeping additional service calls to a minimum. Brickcom has recently announced availability of an outdoor bullet network camera series. The Brickcom Bullet Camera series adopts Wide Dynamic Range sensors that allow the bullet camera to handle extreme variations in brightness within the same sense. It also makes it possible to view whatever the human eye is able to view under rapidly changing lighting conditions. The Brickcom Bullet Camera series offers a highly efficient H.264/MJPEG/MPEG-4 video compression which reduces bandwidth and storage requirements without ever compromising the quality of your image. It can also deliver dual configurable video streams simultaneously at 30fps at a D1 resolution. The Brickcom Bullet Camera series also has support for power over Ethernet which enables the bullet camera to receive power through the same cable it receives data transmission through. This makes installation simple and eliminates your need for an external power source. There is also support for SD/SDHC memory cards which allows the camera to back up local storage if a data connection is lost. Smart Focus is a special function added to the cameras that allows users and installers to configure settings remotely in order to get the best picture quality without any complicated procedures. Brickcom also provides multiple wireless options to make connectivity to your network easier by adopting IEEE 802.11 a/b/g/n technology and a 3.5G HSUPA module. Installation will not be restricted by location or landforms and the Brickcom Bullet Camera series can be set with any wireless or 3G signals. In addition to that, the Brickcom Bullet Camera series comes with an IP67 enclosure allowing the camera to resist rust, torrential rain, high winds, dust, snow, ice or any other kind of harsh condition. The industrial fan and heater located in the Brickom Bullet Camera series also allows the cameras to resist harsh weather. If you are in the market for a heavy duty bullet camera with a wide dynamic range sensor, then check out the Brickcom Bullet Camera series from Brickcom. Wireless Infrared IP Cameras have several advantages over their standard, wired counterparts. One of the biggest advantages a wireless Camera has is that it communicates wirelessly with any standard 802.11/g wireless device, giving this camera the ability to be placed anywhere without the restrictions of wires to hold it back. The camera also offers a high level of security by encrypting its wireless signal and using password protection systems to protect your camera from intruders. Being an IP camera means that you can remotely connect to the camera from a PC and view the camera in real-time. The infrared capabilities of this camera also make this camera an excellent choice to provide monitoring 24 hours a day. These security cameras can also come in outdoor versions that can function perfectly in extreme weather and are resistant to water. Are You Trying To Decide Between Bullet Cameras And Dome Cameras For Outdoor Use?